I am so happy the weather is finally warm again! Pretty dresses, bright colors, the beach—love it all. 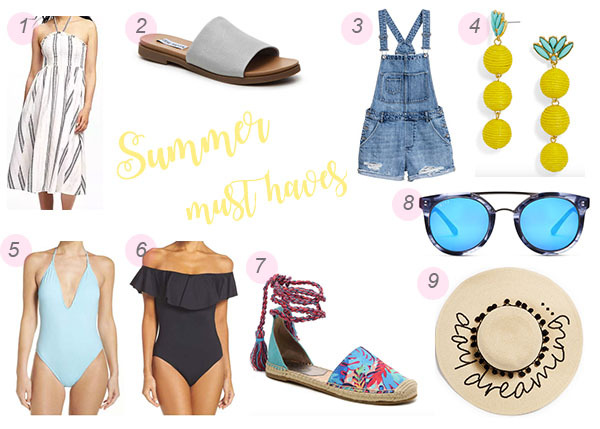 So, I decided to round up a few of my favorite summer must haves to share with you all. Enjoy! 1. In my opinion, dresses are a no doubt summer must have. On those days when it's insanely hot just throwing on a dress is the only option. I've been really into flowy dresses lately and Old Navy has been having the cutest selections! 2. Your summer wardrobe needs a pair of neutral sandals. They're perfect for when you're in a rush and just need to throw a pair of shoes on quick and they match with everything—super win! 3. I've had a major obsession with overalls lately. Overalls, overall shorts, overall dresses just gimmie one of each please! I've seen so many fashion bloggers put their own twist in styling theirs, it makes them such a fun item to have in your wardrobe. Definitly need to invest in a pair asap! 4. Bright, colorful earrings are my favorite. When I don't feel like accessorizing a lot, statement earrings are my go-to. They add the perfect pop of color and most of the time really help bring your look together. If you're in the market for a fun pair of earrings, check out Bauble Bar—they have the best selection. 5 & 6. One pieces are trending again and at first I told myself I would never wear one but now I'm dying to get one. I've been seeing so many cute ones floating the internet and it's making choosing one hard. But how cute is that off-the-shoulder black ruffle one?! 7. Ok.. How gorgeous are these?! I walked past the DSW in my mall the other day and when I saw them I had to go inside and eye them up. I love all of the fun colors and they remind me of something Lilly. They would be so perfect for adding some color to a white dress or just with a pair of jeans and T-shirt! 8. I will forever have a sunglass obsession and never be ashamed of it, lol. The pair that I posted are next on my wishlist because how cute? DIFF Eyewear has the cutest sunglasses that are also reasonably priced. You can also receive $10 off your first order if you shop through my link above! 9. I bought this hat to take on my Europe/London trip and love it!! Floppy hats are the best for vacation, especially the beach.